Ba Jin, who has died aged 100, was the grand old man of Chinese literature, one of the last survivors from the heady years of the real cultural revolution in the 1920s and 1930s. He is best known abroad - and to young Chinese everywhere - for his early work Family (1931). This novel, based on his childhood in a rich household in Sichuan province, shed light on the dark, repressed cavities of the feudal Chinese extended family. The purpose of the trilogy Turbulent Stream, of which Family was the first part (Spring and Autumn followed), was to show how traditional families "inevitably go down the road to ruin, how they dig their graves with their own hands". But the message to Chinese youth was more positive; some might suffer destruction, wrote Ba, but a few at least would succeed in flinging open the windows and bringing in fresh air. More than half a century later, as China emerged from the Maoist era in the 1980s, Ba would again seek to ventilate a China which, beneath the socialist label, still betrayed profound feudal characteristics. He had become a cultural figurehead for the regime, and had only expressed mild criticism in the anti-rightist witchhunt of the late 1950s. He had suffered only moderately in Mao Zedong's cultural revolution (1966-76), having been banned from writing and forced to clean drains. But when his wife died in 1973 after being denied medical care, he began to reflect more deeply on the "blood and fire" that had been visited on China. When cultural apparatchiks threatened another dogmatic onslaught in the late 1980s, he proposed to establish a cultural revolution museum so that the tragedy would never be repeated. "It's not that I don't want to forget: it's simply that the gory spectre of the past has me in its grip ... How I let myself be disarmed, how the disaster crept up on me, just how that tragedy unfolded and the hateful role I played in it all." His Random Thoughts (1987) were all the more powerful because he acknowledged a degree of intellectual complicity, shared, but not always admitted, by many others. Born in the last years of the Manchu dynasty, Ba grew up in Chengdu, the Sichuan capital, in a family of absentee landlords, with about 50 members from four generations and an equal number of servants. After his parents died, family authority passed to his despotic grandfather, though by then the voice of China's "new youth" was beginning to reach Chengdu. Ba read widely and was deeply influenced by Piotr Kropotkin's famous pamphlet, An Appeal to the Young, which "set the heart of a 15-year-old child afire". Family feuds broke out when Ba's grandfather died and authority was transferred to an elder uncle. Finally, in 1923, Ba escaped to continue his studies in Nanking and Shanghai. Like many young people of the time, Ba made a second escape from the chaos of warlord China, moving to France in 1927. In Paris, he joined a group of young Chinese anarchists - news of the execution of the anarchist workers Nicola Sacco and Bartolomeo Vanzetti in the US affected him deeply. His adopted name - chosen in 1929 - reflected his admiration for anarchism: Ba stood for the first syllable in the Chinese transliteration of Mikhail Bakunin, and Jin for the last syllable of Kropotkin. By now, the second nationalist revolution had succeeded in his homeland, and he returned to discover that little changed under the Kuomintang. His experience abroad fused with the tumult of a new China to inspire his greatest writing. He travelled extensively to understand his country better, and this experience brought a new cast of characters - the peasants of China - into his stories. Ba now wrote a succession of novels, including Family and the early trilogy, Love. By 1934, the novel Sprouts had been placed on the blacklist, and Ba was forced to move under an assumed name to Japan, where he had friends. Returning to China two years later, he found himself a prominent figure, although he steered clear of the rival literary factions. But he defended the Spanish anarchists against attacks by Chinese communist sympathisers. After the Japanese declared war on China in 1937, he moved to a succession of wartime capitals, finally returning to Chengdu in 1941 to find that his fifth uncle, a spoilt but charming man, had died in prison. Life had imitated Ba's artistic rendering of feudal decline. Ba's writings reflected the desperation of those years: Ward Four (1946) described the hospital stay in miserable conditions of an unemployed bank worker; Cold Nights (1947) gave a gloomy account of a young couple's lost idealism, with the message that "victory is for them, not for us". It is no wonder then that Ba - and so many other writers - embraced the new communist government and looked determinedly on the bright side. In the two decades before the late 1950s, he wrote nearly 20 novels and translated as many foreign works, while also writing more than 70 short stories. But then his output dwindled sharply and he spent most of his time in his new role as vice-chairman of the official China Writers' Association. In 1958, he declared that there was only one way to be a genuine creative writer: to stand firmly on the proletarian platform. Ba deleted references to anarchism from his earlier work. He also repudiated the one personal fact about his past which everyone knows: the origin of his adopted name. "Ba", he insisted, did not refer to Bakunin but to a fellow-student in France; "Jin" was based on Kropotkin, but he only adopted it as a joke. He also dismissed his early years: he had merely been "reading behind closed doors" and had "cut himself off from the masses". No doubt this repudiation formed part of his regrets in Random Thoughts, a collection of 150 essays written between 1978 and 1986, first published in newspapers and then in a five-volume edition. He wrote that the main mistake of his generation was having "said too many empty words" in the Maoist age to please the cultural bureaucrats. 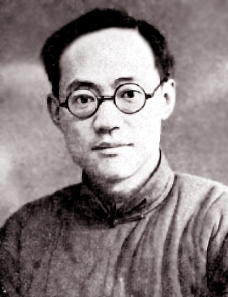 Other pieces included memorial essays to his wife and to literary victims of the cultural revolution, including Lao She, the author of Rickshaw Boy, who had committed suicide. Already suffering from Parkinson's disease, Ba continued to lend his voice to protest. When martial law was declared in May 1989, in the run-up to the Tiananmen Square massacre, he signed an "emergency letter of appeal" by Shanghai writers. Three years later, he joined a petition to liberate art from "pernicious leftism" and criticised the new Mao cult which became briefly voguish among young Chinese in the early 1990s. Though nominally chairman of the writers' association, Ba became increasingly incapacitated and, from 1998, was confined to Shanghai's Huadong hospital. He often repeated the phrase that "old age is a sort of punishment" and asked to be helped to die. He would have preferred to fall on the battlefield, he said, with his pen in his hand. In November 2003 (his 100th birthday by the Chinese way of reckoning), the National Museum of Modern Literature, which he had been instrumental in founding, held an exhibition on his life. Cultural policies were now more relaxed and writers in the Chinese press could applaud his rebellious youth, and lament the lost decade after 1949 when he had, for a while, conformed.